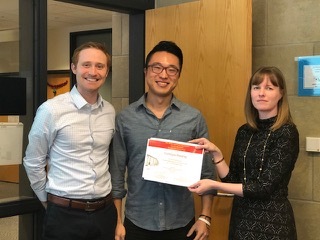 Dohgyu Hwang, graduate student at Iowa State University’s Department of Materials Science and Engineering (MSE), is this year’s recipient of the Melba and Karl Gschneidner Go for the Gold Award. The award, presented by the MSE department, was established by Ames Laboratory senior metallurgist Karl Gschneidner, Jr., with the honorarium he received as recipient of the Acta Materialia Gold Medal in 2008. It’s given annually to an MSE student for the “most exciting, breakthrough research” in a calendar year. The research may be in any topical area in the field of materials science, such as ceramics, metals, polymers, electronics and magnetic materials and so on. The Go for the Gold award requires the recipient to have made groundbreaking research. In the future, Hwang’s work may help people through something as simple as an everyday bandage. “In the United States alone, more than 1.5 million traumatic injuries occur each year while removing medical bandages. Skin tearing occurs especially to those with fragile skins, such as senior citizens, infants and patients with diabetes. This award will encourage me to continue exploring new adhesion/peeling mechanisms to contribute to community wellbeing,” Hwang said.